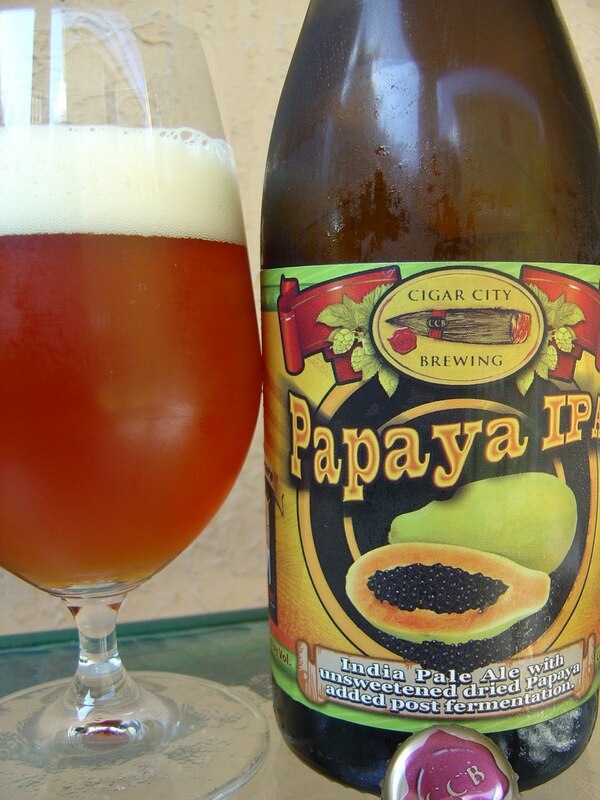 Today I'm drinking Papaya IPA brewed by Cigar City Brewing in Tampa, Florida. I did some checking (which means I threw out a question on Twitter for the crickets to hear) to see if this was their Jai Alai IPA with papaya added to the mix. Waiting for confirmation. If I don't report back, we'll go with that. The label of this wine bottle was designed by Juan Alvarez of Humble Wear. This is the second Cigar City beer with a photo of a less-than-appetizing fruit depiction. The other was designed by another guy for their Guava Grove beer. Cut open papayas with their black, runny, slimy seeds are not how I pray this beer goes down. I mean, the fruit is good, but let your wife clean it. That is when it's less than $1.49 per pound for these 5 pounders. Gonna need to grow my own tree soon at that rate. Anyway, this one was brewed in support of the Florida Brewer's Guild, with proceeds donated to support Florida's native breweries. Bravo, Cigar City dudes! Sweet, fruity and tropical aroma, yes with papaya and a touch of spice. Really different the way the flavors start. You begin with some bitter and hoppy, spicy, peppery jabs at your palate. Yes, there is a fruity angle to this but picking papaya out of the tropical bunch is not really feasible. Some malty and fruity balance does exist but it's thankfully underwhelming, just accenting my IPA. Great bitterness then washes away all balancing intentions. A little herbal, a little grassy, a little more piney: nice combination of bittering flavors. The 7.5% alcohol is not really much more than a drying factor in the end of this beer. It was super-easy to finish all 750 mL of this guy. OK, that's not particularly tough as 750 mL = 2.1 normal beers, so get off my back about drinking an entire wine bottle! Good prickly carbonation and long-lasting bitterness sticks around (go figure.) Tastes like Jai Alai, maybe with a slight fruity twist, so as I said above, let's go with that. In conclusion, yeah it's good but buzz is buzz. Also, adding a few papayas and wrapping this beer up in a bigger bottle in no way justifies tripling the price of an already expensive local beer! I'll trade you for it if you are that interested. I'd be interested to try this one, I've got a bottle of Guava Grove that I haven't opened yet but I've heard great things! And don't you hate it when people get all up in arms for drinking a 750 by yourself? Get a real problem. Bummer!!! This should be better. Agree- I got really excited when I saw "papaya IPA" and Cigar City. Sounds like Jai Alai is better. This was a good beer, no doubt, but I prefer many others, especially for the price. I tried this one on tap at their tasting room. I've had a lot of Jai Alai so it was a nice change of pace. Hey Mike. I've never had any on tap and I've not been to the tasting room yet. But I'd like to go. I just didn't feel like there was really much difference at all to normal Jai Alai.